Y.-C. Lai and C. Grebogi, ``Chaotic scattering in time-dependent Hamiltonian systems,'' International Journal of Bifurcation and Chaos 1, 667-679 (1991). Y.-C. Lai, R. Blumel, E. Ott and C. Grebogi, ``Quantum manifestations of chaotic scattering,'' Physical Review Letters 68, 3491-3494 (1992). Y.-C. Lai, C. Grebogi, R. Blumel and M. Ding, ``Algebraic decay and phase-space metamorphoses in microwave ionization of hydrogen Rydberg atoms,'' Physical Review A 45, 8284-8287 (1992). Y.-C. Lai, M. Ding, C. Grebogi and R. Blumel, ``Algebraic decay and fluctuations of decay exponents in Hamiltonian systems,'' Physical Review A 46, 4661-4669 (1992). Y.-C. Lai, E. Ott and C. Grebogi, ``Temporal crossover from classical to quantum behavior: A Markov-chain approach,'' Physics Letters A 173, 148-152 (1993). Y.-C. Lai, C. Grebogi, R. Blumel and I. Kan, ``Crisis in chaotic scattering,'' Physical Review Letters 71, 2212-2215 (1993). Y.-C. Lai and C. Grebogi, ``Crisis and enhancement of chaotic scattering,'' Physical Review E 49, 3761-3770 (1994). T. Yalcinkaya and Y.-C. Lai, ``Chaotic scattering,'' Computers in Physics 9, 511-518 (1995). Y.-C. Lai, ``Abrupt bifurcation to chaotic scattering with discontinuous change in fractal dimension,'' Physical Review E (Rapid Communications) 60, R6283-R6286 (1999). K. Zyczkowski and Y.-C. Lai, ``Devil-staircase behavior of dynamical invariants in chaotic scattering,'' Physica D 142, 197-216 (2000). Y.-C. Lai, A. P. S. de Moura, and C. Grebogi, ``Topology of high-dimensional chaotic scattering,'' Physical Review E 62, 6421-6428 (2000). A. E. Motter and Y.-C. Lai, ``Dissipative chaotic scattering,'' Physical Review E (Rapid Communications) 65, 015205 (2002). A. P. S. de Moura, Y.-C. Lai, R. Akis, J. Bird, and D. K. Ferry, ``Tunneling and nonhyperbolicity in quantum dots,'' Physical Review Letters 88, 236804 (2002). A. E. Motter and Y.-C. Lai, ``Dimension scaling of topological bifurcations in chaotic scattering,'' Physical Review E (Rapid Communications) 65, 065201 (2002). J. P. Bird, R. Akis, D. K. Ferry, A. P. S. de Moura, Y.-C. Lai, and K. M. Indlekofer, ``Interference and interactions in open quantum dots,'' Reports on Progress in Physics 66, 583-632 (2003). J. Seoane, J. Aguirre, M. A. F. Sanjuan, and Y.-C. Lai, ``Basin topology in dissipative chaotic scattering,'' Chaos 16, 023101 (2006). J. M. Seoane, M. A. F. Sanjuan, and Y.-C. Lai, ``Fractal dimension in dissipative chaotic scattering,'' Physical Review E 76, 016208 (2007). J. M. Seoane, L. Huang, M. A. F. Sanjuan, and Y.-C. Lai, ``Effect of noise on chaotic scattering,'' Physical Review E 79, 047202 (2009). One figure from this work was selected by journal web site of Physical Review E as part of ``Kaleidoscope'' (http://pre.aps.org). L. Huang, Y.-C. Lai, D. K. Ferry, R. Akis, and S. M. Goodnick, ``Transmission and scarring in graphene quantum dots,'' Journal of Physics: Condensed Matter 21, 344203 (2009). D. K. Ferry, L. Huang, R. Yang, Y.-C. Lai, and R. Akis, ``Open quantum dots in graphene: scaling relativistic pointer states,'' Progress in Nonequilibriym Green's Functions IV - Journal of Physics: Conference Series 220, 012015 (2010). L. Huang, Y.-C. Lai, and C. Grebogi, ``Characteristics of level-spacing statistics in chaotic graphene billiards,'' Chaos 21, 013102 (2011). R. Yang, L. Huang, Y.-C. Lai, and C. Grebogi, ``Quantum chaotic scattering in graphene systems,'' Europhysics Letters 94, 40004 (2011). L. Huang, R. Yang, and Y.-C. Lai, ``Geometry-dependent conductance oscillations in graphene quantum dots,'' Europhysics Letters 94, 58003 (2011). R. Yang, L. Huang, Y.-C. Lai, and C. Grebogi, ``Abnormal electron paths induced by Klein tunneling in graphene quantum point contacts,'' Physical Review B 84, 035426 (2011). R. Yang, L. Huang, Y.-C. Lai, and L. M. Pecora, ``Modulating quantum transport by transient chaos,'' Applied Physics Letters 100, 093105 (2012). X. Ni, L. Huang, Y.-C. Lai and L. M. Pecora, ``Effect of chaos on relativistic quantum tunneling,'' Europhysics Letters 98, 50007 (2012). This paper was selected to be highlighted in Europhysics News in July-August 2012. L. Ying, L. Huang, Y.-C. Lai, and C. Grebogi, ``Conductance fluctuations in graphene systems: The relevance of classical dynamics,'' Physical Review B 85, 245448 (2012). X. Ni, L. Huang, Y.-C. Lai and C. Grebogi, ``Scarring of Dirac fermions in chaotic billiards,'' Physical Review E 86, 016702 (2012). H.-Y. Xu, L. Huang, Y.-C. Lai, and C. Grebogi, ``Chiral scars in chaotic Dirac fermion systems,'' Physical Review Letters 110, 064102 (2013). L. Huang, R. Yang, Y.-C. Lai, and D. K. Ferry, ``Lead-position dependent regular oscillations and random fluctuations of conductance in graphene quantum dots,'' Journal of Physics: Condensed Matters 25, 085502 (2013). L. Ying, L. Huang, Y.-C. Lai, and Y. Zhang, ``Effect of geometrical rotation on conductance fluctuations in graphene quantum dots,'' Journal of Physics: Condensed Matters 25, 105802 (2013). R. Yang, L. Huang, Y.-C. Lai, C. Grebogi, and L. M. Pecora, ``Harnessing quantum transport by transient chaos,'' Chaos 23, 013125 (2013). G.-L. Wang, L. Ying, Y.-C. Lai, and C. Grebogi, ``Quantum chaotic scattering in graphene systems in the absence of invariant classical dynamics,'' Physical Review E 87, 052908 (2013). X. Ni, L. Huang, L. Ying, and Y.-C. Lai, ``Relativistic quantum tunneling of Dirac fermions in nonhyperbolic chaotic systems,'' Physical Review B 87, 224304 (2013). L. Huang, H.-Y. Xu, Y.-C. Lai, and C. Grebogi, ``Level spacing statistics for two-dimensional massless Dirac billiards,'' Chinese Physics B 23, Article number 070507 (2014). L. Ying, G.-L. Wang, L. Huang, and Y.-C. Lai, ``Quantum chaotic tunneling in graphene systems with electron-electron interactions,'' Physical Review B 90, Article number 224301 (2014). L. Huang, Y.-C. Lai, H.-G. Luo, and C. Grebogi, ``Universal formalism of Fano resonance,'' AIP Advances 5, Article number 017137 (2015). H.-Y. Xu, L. Huang, Y.-C. Lai, and C. Grebogi, ``Superpersistent currents and whispering gallery modes in relativistic quantum chaotic systems,'' Scientific Reports 5, Article number 8963 (2015). R. Bao, L. Huang, Y.-C. Lai, and C. Grebogi, ``Conductance fluctuations in chaotic bilayer graphene quantum dots,'' Physical Review E 92, Article number 012918 (2015). G.-L. Wang, L. Ying, and Y.-C. Lai, ``Conductance stability in chaotic and integrable quantum dots with random impurities,'' Physical Review E 92, Article number 022901 (2015). H.-Y. Xu and Y.-C. Lai, ``Reverse Stark effect, anomalous optical transitions, and control of spin in topological insulator quantum dots,'' Physical Review B 92, Article number 195120 (2015). G.-L. Wang, H.-Y. Xu, and Y.-C. Lai, ``Nonlinear dynamics induced anomalous Hall effect in topological insulators,'' Scientific Reports 6, Article number 19803 (2016). L. Ying and Y.-C. Lai ``Enhancement of spin polarization by chaos in graphene quantum dot systems,'' Physical Review B 93, Article number 085408 (2016). M.-K. Xu, Y.-S. Wang, R. Bao, L. Huang, and Y.-C. Lai, ``Complex transport behaviors of graphene quantum dots subject to mechanical vibrations,'' Europhysics Letters 114, Article number 47006 (2016). H.-Y. Xu and Y.-C. Lai, ``Revival resonant scattering, perfect caustics and isotropic transport of pseudospin-1 particles,'' Physical Review B 94, Article number 165405 (2016). P. Yu, Z.-Y. Li, H.-Y. Xu, L. Huang, B. Dietz, C. Grebogi, and Y.-C. Lai, ``Gaussian orthogonal ensemble statistics in graphene billiards with the shape of classically integrable billiards,'' Physical Review E 94, Article number 062214 (2016). H.-Y. Xu and Y.-C. Lai, ``Superscattering of pseudospin-1 wave in photonic lattice,'' Physical Review A 95, Article number 012119 (2017). G.-L. Wang, H.-Y. Xu, and Y.-C. Lai, ``Mechanical topological semimetals with massless quasiparticles and a finite Berry curvature,'' Physical Review B 95, Article number 235159 (2017). H.-Y. Xu, L. Huang, D.-H. Huang, and Y.-C. Lai, ``Geometric valley Hall effect and valley filtering through a singular Berry flux,'' Physical Review B 96, Article number 045412 (2017). C.-Z. Wang, H.-Y. Xu, L. Huang, and Y.-C. Lai, ``Nonequilibrium transport in the pseudospin-1 Dirac-Weyl system,'' Physical Review B 96, Article number 115440 (2017). L. Ying and Y.-C. Lai, ``Robustness of persistent currents in two-dimensional Dirac systems with disorders,'' Physical Review B 96, Article number 165407 (2017). L. Ying, L. Huang, and Y.-C. Lai, ``Enhancing optical response of graphene through stochastic resonance,'' Physical Review B 97, Article number 144204 (2018). L. Huang, H.-Y. Xu, C. Grebogi, and Y.-C. Lai, ``Relativistic quantum chaos,'' Physics Reports 753, 1-128 (2018). C.-D. Han, C.-Z. Wang, H.-Y. Xu, D.-H. Huang, and Y.-C. Lai, ``Decay of semiclassical massless Dirac fermions from integrable and chaotic cavities,'' Physical Review B 98, 104308 (2018). C.-Z. Wang, H.-Y. Xu, N. D. Rizzo, R. A. Kiehl, and Y.-C. Lai, ``Phase locking of a pair of ferromagnetic nano-oscillators on a topological insulator,'' Physical Review Applied 10, 064003 (2018). G.-L. Wang, H.-Y. Xu, and Y.-C. Lai, ``Can a photonic thermalization gap arise in disordered non-Hermitian Hamiltonian systems?'' EPL (Europhysics Letters) 125, 30003 (2019). C.-Z. Wang, C.-D. Han, H.-Y. Xu, and Y.-C. Lai, ``Chaos-based Berry phase detector,'' Physical Review B 99, 144302 (2019). Y.-C. Lai, M. Ding and C. Grebogi, ``Controlling Hamiltonian chaos,'' Physical Review E 47, 86-92 (1993). Y.-C. Lai and C. Grebogi, ``Synchronization of chaotic trajectories using control,'' Physical Review E 47, 2357-2360 (1993). Y.-C. Lai, T. Tel and C. Grebogi, ``Stabilizing chaotic scattering trajectories using control,'' Physical Review E 48, 709-717 (1993). Y.-C. Lai and C. Grebogi, ``Converting transient chaos into sustained chaos by feedback control,'' Physical Review E 49, 1094-1098 (1994). Y.-C. Lai and C. Grebogi, ``Synchronization of spatiotemporal chaotic systems by feedback control,'' Physical Review E 50, 1894-1899 (1994). Y.-C. Lai, ``Controlling chaos,'' Computers in Physics 8, 62-67 (1994). Y. Nagai and Y.-C. Lai, ``Selection of desirable chaotic phase using small feedback control,'' Physical Review E 51, 3842-3848 (1995). Y. Nagai, X. D. Hua and Y.-C. Lai, ``Controlling on-off intermittent dynamics,'' Physical Review E 54, 1190-1199 (1996). Y.-C. Lai, ``Synchronism in symmetric hyperchaotic systems,'' Physical Review E (Rapid Communications) 55, R4861-4864 (1997). Y.-C. Lai, ``Driving trajectories to a desirable attractor by using small control,'' Physics Letters A 221, 375-383 (1996). C. Grebogi, Y.-C. Lai, and S. Hayes ``Control and applications of chaos,'' Journal of Franklin Institute 334B, 1115-1146 (1997); also published in International Journal of Bifurcation and Chaos 7, 2175-2198 (1997). C. Grebogi and Y.-C. Lai, ``Controlling chaotic dynamical systems,'' Systems and Control Letters 31, 307-312 (1997). C. Grebogi and Y.-C. Lai, ``Controlling chaos in high dimensions,'' IEEE Transaction on Circuits and Systems (I) 44, 971-975 (1997). L.-Y. Cao and Y.-C. Lai, ``Anti-phase synchronism in chaotic systems,'' Physical Review E 58, 382-386 (1998). M. Dhamala and Y.-C. Lai, ``Controlling transient chaos in deterministic flows with applications to electrical power systems and ecology,'' Physical Review E 59, 1646-1655 (1999). L. Shulenburger, Y.-C. Lai, T. Yalcinkaya, and R. D. Holt, ``Controlling transient chaos to prevent species extinction,'' Physics Letters A 260, 156-161 (1999). V. Andrade, R. Davidchack, and Y.-C. Lai, ``Noise scaling in phase synchronization of coupled chaotic oscillators,'' Physical Review E 61, 3230-3233 (2000). S. Boccaletti, C. Grebogi, Y.-C. Lai, H. Mancini, and D. Maza, ``Control of chaos: theory and applications,'' Physics Reports 329, 103-197 (2000). R. Tonelli, Y.-C. Lai, and C. Grebogi, ``Feedback synchronization using pole-placement control,'' International Journal of Bifurcation and Chaos 10, 2611-2617 (2000). Z.-H. Liu, Y.-C. Lai, and F. C. Hoppensteadt, ``Phase clustering and transition to phase synchronization in a large number of coupled nonlinear oscillators,'' Physical Review E (Rapid Communications) 63, 055201 (2001). E. N. Macau, C. Grebogi, and Y.-C. Lai, ``Active synchronization in nonhyperbolic hyperchaotic systems,'' Physical Review E 65, 027202 (2002). Y.-C. Lai, E. M. Bollt, and Z. Liu, ``Low-dimensional chaos in high-dimensional phase space: how does it occur?'' Chaos, Solitons, and Fractals 15, 219-232 (2002). J. Kurths, S. Boccaletti, C. Grebogi, and Y.-C. Lai, ``Introduction: Control and synchronization in chaotic dynamical systems,'' Chaos (Focused Issue) 13, 126-127 (2003). X.-G. Wang, Y.-C. Lai, and C. H. Lai, ``Effect of resonant frequency mismatch on attractors,'' Chaos 16, 023127 (2006). L. Zhao, Y.-C. Lai, R. Wang, and J.-Y. Gao, ``Limits to chaotic phase synchronization,'' Europhysics Letters 66, 324-330 (2004). L. Zhao, Y.-C. Lai, and C.-W. Shih, ``Transition to intermittent chaotic synchronization,'' Physical Review E 72, 036212 (2005). S.-G. Guan, Y.-C. Lai, C. H. Lai, and X.-F. Gong, ``Understanding synchronization induced by common noise,'' Physics Letters A 353, 30-33 (2006). S.-G. Guan, Y.-C. Lai, and C. H. Lai, ``Effect of noise on generalized chaotic synchronization,'' Physical Review E 73, 046210 (2006). K. Park, Y.-C. Lai, S. Krishnamoorthy, and A. Kandangath, ``Effect of common noise on phase synchronization in coupled chaotic oscillators,'' Chaos 17, 013105 (2007). K. Park, Y.-C. Lai, and S. Krishnamoorthy, ``Frequency dependence of phase-synchronization time in nonlinear dynamical systems,'' Chaos 17, 043111 (2007). K. Park, Q.-F. Chen, and Y.-C. Lai, ``Energy enhancement and chaos control in microelectromechanical systems,'' Physical Review E 77, 026210 (2008). L. Huang, Q.-F. Chen, Y.-C. Lai, and L. M. Pecora, ``Generic behavior of master-stability functions in coupled nonlinear dynamical systems,'' Physical Review E 80, 036204 (2009). Q.-F. Chen, L. Huang, Y.-C. Lai, and D. Dietz, ``Dynamical mechanism of intrinsic localized modes in microelectromechanical oscillator arrays,'' Chaos 19, 013127 (2009). Q.-F. Chen, L. Huang, Y.-C. Lai, C. Grebogi, and D. Dietz, ``Extensive chaos in electrostatically-driven Si-nanowires and applications,'' Nano Letters 10, 406-413 (2010). Q.-F. Chen, Y.-C. Lai, and D. Dietz, ``Controlled generation of intrinsic localized modes in microelectromechanical cantilever arrays,'' Chaos 20, 043139 (2010). Q.-F. Chen, Y.-C. Lai, J. Chae, and Y.-H. Do, ``Anti-phase synchronization in microelectromechanical systems and effect of impulsive perturbations,'' Physical Review B 87, 144304 (2013). X. Ni, L. Ying, Y.-C. Lai, Y.-H. Do, and C. Grebogi, ``Complex dynamics in nanosystems,'' Physical Review E 87, 052911 (2013). P. Hessari, Y.-H. Do, Y.-C. Lai, J.-S. Chae, C.-W. Park, and G.-W. Lee, ``Regularization of chaos by noise in electrically driven nanowire systems,'' Physical Review B 89, Article number 134304 (2014). W.-C. Yang, Z.-G. Huang, X.-G. Wang, L. Huang, L. Yang, and Y.-C. Lai, ``Complex behavior of chaotic synchronization under dual coupling channels,'' New Journal of Physics 17, Article number 023055 (2015). L. Ying, D.-H. Huang, and Y.-C. Lai, ``Multistability, chaos, and random signal generation in semiconductor superlattices,'' Physical Review E 93, Article number 062204 (2016). A. Chen, S.-Y. Nam, Y.-C. Lai, and J.-S. Chae, ``Low-voltage shock mitigated micro-electromechanical systems structure,'' Applied Physics Letters 110, Article number 201903 (2017). Y.-C. Lai, ``The study of spatial coherence of optical fibers,'' Optical Instruments (in Chinese) 7, 61-69 (1985). R. L. Davidchack, Y.-C. Lai, A. Gavrielides, and V. Kovanis, ``Dynamical origin of low-frequency fluctuations in external cavity semiconductor lasers,'' Physics Letters A 267, 350-356 (2000). R. L. Davidchack, Y.-C. Lai, A. Gavrielides, and V. Kovanis, ``Chaotic transitions and low-frequency fluctuations in semiconductor lasers with optical feedback,'' Physica D 145, 130-143 (2000). R. L. Davidchack, Y.-C. Lai, A. Gavrielides, and V. Kovanis, ``Regular dynamics of low-frequency fluctuations in semiconductor lasers with optical feedback,'' Physical Review E 63, 056206 (2001). A. Prasad, Y.-C. Lai, A. Gavrielides, and V. Kovanis, ``Low-frequency fluctuations in external-cavity semiconductor lasers: understanding based on a reduced Lang-Kobayashi model,'' Journal of Optics B: Quantum and Semiclassical Optics 3, 242-250 (2001). Z. Liu and Y.-C. Lai, ``Chaotic scattering in deformed optical microlasing cavities,'' Physical Review E 65, 046204 (2002). A. Prasad, Y.-C. Lai, A. Gavrielides, and V. Kovanis, ``Complicated basins in coupled external-cavity semiconductor lasers,'' Physics Letters A 314, 44-50 (2003). A. Prasad, Y.-C. Lai, A. Gavrielides, and V. Kovanis, ``Amplitude modulation in coupled external-cavity semiconductor lasers,'' Physics Letters A 318, 71-77 (2003). A. Rinaldi, P. Peralta, D. Krajcinovic, and Y.-C. Lai, ``Prediction of scatter in fatigue properties using discrete damage mechanics,'' International Journal of Fatigue 28, 1069-1080 (2006). A. Rinaldi and Y.-C. Lai, ``Statistical damage theory of 2D lattices: Energetics and physical foundations of damage parameter,'' International Journal of Plasticity 23, 1796-1825 (2007). A. Rinaldi, D. Krajcinovic, P. Peralta, and Y.-C. Lai, ``Lattice models of polycrystalline microstructures: A quantatitive approach,'' Mechanics of Materials 40, 17-36 (2008). X. Ni, W.-X. Wang and Y.-C. Lai, ``Origin of branched wave structure in optical media and long-tail algebraic intensity distribution,'' Europhysics Letters 96, 44002, 1-6 (2011). X. Ni, Y.-C. Lai, and W.-X. Wang, ``Emergence of scaling associated with complex branched wave structures in optical medium,'' Chaos 22, 043116 (2012). G.-L. Wang, L. Huang, Y.-C. Lai, and C. Grebogi, ``Nonlinear dynamics and quantum entanglement in optomechanical systems,'' Physical Review Letters 112, Article number 110406 (2014). L. Ying, Y.-C. Lai, and C. Grebogi, ``Quantum manifestation of synchronization transition in optomechanical systems,'' Physical Review A 90, Article number 053810 (2014). G.-L. Wang, Y.-C. Lai, and C. Grebogi, ``Transient chaos - a resolution of breakdown of quantum-classical correspondence in optomechanics,'' Scientific Reports 6, Article number 35381 (2016). G.-L. Wang, H.-Y. Xu, L. Huang, and Y.-C. Lai, ``Relativistic Zitterbewegung in non-Hermitian photonic waveguide systems,'' New Journal of Physics 19, Article number 013017 (2017). B. S. Park, C. Grebogi and Y.-C. Lai, ``Abrupt dimension changes at basin boundary metamorphoses,'' International Journal of Bifurcation and Chaos 2, 533-541 (1992). Y.-C. Lai, C. Grebogi, J. A. Yorke and I. Kan, ``How often are chaotic saddles nonhyperbolic?,'' Nonlinearity 6, 779-797 (1993). Y.-C. Lai and C. Grebogi, ``Intermingled basins and two-state on-off intermittency,'' Physical Review E (Rapid Communications) 52, R3313-R3316 (1995). Y.-C. Lai and C. Grebogi, ``Characterizing riddled fractal sets,'' Physical Review E 53, 1371-1374 (1996). Y.-C. Lai, ``Symmetry-breaking bifurcation with on-off intermittency in chaotic dynamical systems,'' Physical Review E (Rapid Communications) 53, R4267-R4270 (1996). Y.-C. Lai, ``Distinct small-distance scaling behaviors of on-off intermittency in chaotic dynamical systems,'' Physical Review E 54, 321-327 (1996). Y.-C. Lai, C. Grebogi, J. A. Yorke, and S. C. Venkataramani, ``Riddling bifurcation in chaotic dynamical systems,'' Physical Review Letters 77, 55-58 (1996). K. G. Szabo, Y.-C. Lai, T. Tel, and C. Grebogi, ``Critical exponent for gap-filling at crisis,'' Physical Review Letters 77, 3102-3105 (1996). Y.-C. Lai and C. Grebogi, ``Noise-induced riddling in chaotic dynamical systems,'' Physical Review Letters 77, 5047-5050 (1996). Y. Nagai and Y.-C. Lai, ``Characterization of blowout bifurcation by unstable periodic orbits,'' Physical Review E (Rapid Communications) 55, R1251-R1254 (1997). Y.-C. Lai, ``Scaling laws for symmetry breaking by blowout bifurcation in chaotic systems,'' Physical Review E 56, 1407-1413 (1997). Y.-C. Lai, ``Scaling laws for noise-induced temporal riddling in chaotic systems,'' Physical Review E 56, 3897-3908 (1997). Y.-C. Lai, K. Zyczkowski, and C. Grebogi, ``Universal behavior in the parameter evolution of chaotic saddles,'' Physical Review E 59, 5261-5265 (1999). Y.-C. Lai and C. Grebogi, ``Riddling of chaotic sets in periodic windows,'' Physical Review Letters 83, 2926-2929 (1999). Y.-C. Lai, ``Transient fractal behavior in snapshot attractors of driven chaotic systems,'' Physical Review E 60, 1558-1562 (1999). T. Kapitaniak, Y.-C. Lai, and C. Grebogi, ``Metamorphosis of chaotic saddles,'' Physics Letters A 259, 445-450 (1999). T. Kapitaniak, Y.-C. Lai, and C. Grebogi, ``Blowout bifurcation of chaotic saddles,'' Discrete Dynamics in Nature and Society 3, 9-13 (1999). K. G. Szabo, Y.-C. Lai, T. Tel, and C. Grebogi, ``Topological scaling and gap filling at crisis,'' Physical Review E 61, 5019-5032 (2000). Y.-C. Lai, D. Armbruster, and E. J. Kostelich, ``Intermittency in chaotic rotations,'' Physical Review E (Rapid Communications) 62, R29-R32 (2000). Y.-C. Lai, ``Catastrophe of riddling,'' Physical Review E (Rapid Communications), 62, R4505-R4508 (2000). Y.-C. Lai, ``Pseudo-riddling in chaotic systems,'' Physica D 150, 1-13 (2001). Daniel Marthaler, Dieter Armbruster, Y.-C. Lai, and Eric J. Kostelich, ``Perturbed on-off intermittency,'' Physical Review E 64, 016220 (2001). Y.-C. Lai and V. Andrade, ``Catastrophic bifurcation from riddled to fractal basins,'' Physical Review E 64, 056228 (2001). Y.-C. Lai, D. Armbruster, and E. J. Kostelich, ``Reply to `Comment on `Intermittency in chaotic rotations,' '' Physical Review E 64, 058204 (2001). V. Andrade and Y.-C. Lai, ``Super persistent chaotic transients in physical systems: effect of noise on phase synchronization of coupled chaotic oscillators,'' International Journal of Bifurcation and Chaos 11, 2607-2619 (2001). A. E. Motter, Y.-C. Lai, and C. Grebogi, ``Reactive dynamics of inertial particles in nonhyperbolic chaotic flows,'' Physical Review E 68, 056307 (2003). Y.-H. Do and Y.-C. Lai, ``Superpersistent chaotic transients in physical space - advective dynamics of inertial particles in open chaotic flows under noise,'' Physical Review Letters 91, 224101 (2003). Y.-H. Do and Y.-C. Lai, ``Extraordinarily superpersistent chaotic transients,'' Europhysics Letters 67, 914-920 (2004). Y.-H. Do and Y.-C. Lai, ``Stability of attractors formed by inertial particles in open chaotic flows,'' Physical Review E 70, 036203 (2004). Y.-H. Do and Y.-C. Lai, ``Scaling laws for noise-induced superpersistent chaotic transients,'' Physical Review E 71, 046208 (2005). Y.-C. Lai, D.-R. He, and Y.-M. Jiang, ``Basins of attraction in piecewise smooth Hamiltonian systems,'' Physical Review E (Rapid Communications) 72, 025201 (2005). Y.-C. Lai, ``Extreme fluctuations of finite-time Lyapunov exponents in chaotic systems,'' International Journal of Modern Physics B 21, 3941-3946 (2007). Y.-H. Do and Y.-C. Lai, ``Multistability and arithmetically period-adding bifurcations in piecewise smooth dynamical systems,'' Chaos 18, 043107 (2008). R. Serquina, Y.-C. Lai, and Q.-F. Chen, ``Characterization of nonstationary chaotic systems,'' Physical Review E 77, 026208 (2008). T. Tel, Y.-C. Lai, and M. Gruiz, ``Noise-induced chaos: a consequence of long deterministic transients,'' International Journal of Bifurcation and Chaos 18, 509-520 (2008). T. Tel and Y.-C. Lai, ``Chaotic transients in spatially extended systems,'' Physics Reports 460, 245-275 (2008). Y.-Z. Xiao, Y. Wang, and Y.-C. Lai, ``Dependence of intermittency scaling on threshold in chaotic systems,'' Physical Review E 80, 057202 (2009). X. Ni and Y.-C. Lai, ``Transient chaos in optical metamaterials,'' Chaos 21, 033116 (2011). H.-L. Zou, M.-L. Li, C. H. Lai, and Y.-C. Lai, ``Origin of long chaotic transients in networks of pulse-coupled oscillators,'' Physical Review E 86, 066214 (2012). H.-L. Zou, Y. Katori, Z.-C. Deng, K. Aihara, and Y.-C. Lai, ``Controlled generation of heteroclinic switching dynamics among metastable states in pulse-coupled oscillator networks,'' Chaos 25, Article number 103109 (2015). H.-L. Zou, Z.-C. Deng, W.-P. Hu, K. Aihara, and Y.-C. Lai, ``Partially unstable attractors in networks of forced integrate-and-fire oscillators,'' Nonlinear Dynamics 88, Article number 34905 (2017). Y.-C. Lai and R. L. Winslow, ``Extreme sensitive dependence on parameters and initial conditions in spatiotemporal chaotic dynamical systems,'' Physica D 74, 353-371 (1994). Y.-C. Lai and R. L. Winslow, ``Riddled parameter space in spatiotemporal chaotic dynamical systems,'' Physical Review Letters 72, 1640-1643 (1994). Y.-C. Lai and R. L. Winslow, ``Fractal basin boundaries in coupled map lattices,'' Physical Review E 50, 3470-3473 (1994). Y.-C. Lai, C. Grebogi and E. Kostelich, ``Extreme final state sensitivity in asymmetric spatiotemporal chaotic systems,'' Physics Letters A 196, 206-212 (1994). Y.-C. Lai, ``Unpredictability of asymptotic attractors of phase-coupled oscillators,'' Physical Review E 51, 2902-2908 (1995). Y.-C. Lai, ``Persistence of supertransients of spatiotemporal chaotic dynamical systems in noisy environment,'' Physics Letters A 200, 418-422 (1995). Y.-C. Lai and R. L. Winslow, ``Geometric properties of the chaotic saddle responsible for supertransients in spatiotemporal chaotic systems,'' Physical Review Letters 74, 5208-5211 (1995). M. A. Harrison and Y.-C. Lai, ``A route to high-dimensional chaos,'' Physical Review E (Rapid Communications) 59, R3799-R3802 (1999). M. A. Harrison and Y.-C. Lai, ``Bifurcation to high-dimensional chaos,'' International Journal of Bifurcation and Chaos 10, 1471-1483 (2000). Z. Liu, Y.-C. Lai, and M. A. Matias, ``Universal scaling of Lyapunov exponents in coupled chaotic oscillators,'' Physical Review E (Rapid Communications), 67, 045203 (2003). M. A. F. Harrison and Y.-C. Lai, ``Continuum coupled-map approach to pattern formation in oscillating granular layers: robustness and limitation,'' International Journal of Bifurcation and Chaos 18, 1627-1643 (2008). L. Du, Q.-F. Chen, Y.-C. Lai, and W. Xu, ``Observation-based control of rare intense events in the complex Ginzburg-Landau equation,'' Physical Review E (Rapid Communications) 78, 015201(R) (2008). Y.-Y. Park, Y.-H. Do, S. Altmeyer, Y.-C. Lai, and G.-W. Lee ``Early effect in time-dependent, high-dimensional nonlinear dynamical systems with multiple resonances,'' Physical Review E 91, Article number 022906 (2015). S. Altmeyer, Y.-H. Do, and Y.-C. Lai, ``Transition to turbulence in Taylor-Couette ferrofluidic flow,'' Scientific Reports 5, Article number 10781 (2015). S. Altmeyer, Y.-H. Do, and Y.-C. Lai, ``Ring bursting behavior en route to turbulence in narrow gap Taylor-Couette flows,'' Physical Review E 92, Article number 053108 (2015). S. Altmeyer, Y.-H. Do, and Y.-C. Lai, ``Magnetic field induced flow pattern reversal in a ferrofluidic Taylor-Couette system,'' Scientific Reports 5, Article number 18589 (2015). S. Altmeyer, Y.-H. Do, and Y.-C. Lai, ``Dynamics of ferrofluidic flow in the Taylor-Couette system with a small aspect ratio,'' Scientific Reports 7, Article number 40012 (2017). R.-H. Du, S.-X. Qu, and Y.-C. Lai, ``Transition to high-dimensional chaos in nonsmooth dynamical systems,'' Physical Review E 98, 052212 (2018). D. Cai, Y.-C. Lai and R. L. Winslow, ``Complex dynamics in coupled cardiac pacemaker cells,'' Physical Review Letters 71, 2501-2504 (1993). Y.-C. Lai, R. L. Winslow and M. B. Sachs, ``A model of selective processing of auditory-nerve inputs by stellate cells of the antero-ventral cochlear nucleus,'' Journal of Computational Neuroscience 1(3), 167-194 (1994). Y.-C. Lai, R. L. Winslow and M. B. Sachs, ``The functional role of excitatory and inhibitory interactions in chopper cells of the antero-ventral cochlear nucleus,'' Neural Computation 6, 1126-1139 (1994). R. L. Winslow, D. Cai, A. Varghese and Y.-C. Lai, ``Generation and propagation of normal and abnormal pacemaker activity in network models of cardiac sinus node and atrium,'' Chaos, Solitons, and Fractals 5, 491-512 (1995). M. A. Harrison, Y.-C. Lai, and R. D. Holt, ``A dynamical mechanism for coexistence of dispersing species without trade-offs in spatially extended ecological systems,'' Physical Review E 63, 051905 (2001). M. Dhamala, Y.-C. Lai, and R. D. Holt, ``How often are chaotic transients in spatially extended ecological systems?'' Physics Letters A 280, 297-302 (2001). I. Osorio, M. A. Harrison, Y.-C. Lai, and M. Frei, ``Observations on the application of correlation dimension and integral to prediction of seizures,'' Journal of Clinical Neurophysiology 18, 269-274 (2001). M. A. Harrison, Y.-C. Lai, and R. D. Holt, ``Dynamical mechanism for coexistence of dispersing species,'' Journal of Theoretical Biology 213, 53-72 (2001). L. Zhu, Y.-C. Lai, F. Hoppensteadt, and J. He, ``Probing changes in neural interaction during adaptation,'' Neural Computation 15, 2359-2377 (2003). T. Nishikawa, Y.-C. Lai, and F. C. Hoppensteadt, ``Capacity of oscillatory associative-memory networks with error-free retrieval,'' Physical Review Letters 92, 108101 (2004). This research was featured in Physical Review Focus (March 12, 2004). Y.-C. Lai, M. A. F. Harrison, M. G. Frei, and I. Osorio, ``Controlled test for predictive power of Lyapunov exponents: their inability to predict epileptic seizures,'' Chaos 14, 630-642 (2004). T. Nishikawa, F. C. Hoppensteadt, and Y.-C. Lai, ``Oscillatory associative memory network with perfect retrieval,'' Physica D 197, 134-148 (2004). L. Zhu, Y.-C. Lai, F. C. Hoppensteadt, and J. He, ``Characterization of neural interaction during learning and adaptation from spike-train data,'' Mathematical Biosciences and Engineering 2, 1-23 (2005). M. A. F. Harrison, I. Osorio, M. G. Frei, S. Asuri, and Y.-C. Lai, ``Correlation dimension and integral do not predict epileptic seizures,'' Chaos 15, 033106 (2005). Y.-C. Lai and K. Park, ``Noise sensitive measure for characterization of stochastic resonance in biological oscillators,'' Mathematical Biosciences and Engineering 3, 583-602 (2006). H.-J. Shi, W.-X. Wang, R. Yang, and Y.-C. Lai, ``Basins of attraction for species extinction and coexistence in spatial rock-paper-scissors games,'' Physical Review E (Rapid Communications) 81, 030901(R) (2010). L.-L. Jiang, W.-X. Wang, Y.-C. Lai, and B.-H. Wang, ``Role of adaptive migration in promoting cooperation in spatial games,'' Physical Review E 81, 036108 (2010). W.-X. Wang, R. Yang, and Y.-C. Lai, ``Cascade of elimination and emergence of pure cooperation in coevolutionary games on networks,'' Physical Review E (Rapid Communications) 81, 035102(R) (2010). W.-X. Wang, Y.-C. Lai, and C. Grebogi, ``Effect of epidemic spreading on species coexistence in spatial games,'' Physical Review E 81, 046113 (2010). One figure from this work was selected by journal web site of Physical Review E as part of ``Kaleidoscope'' (http://pre.aps.org). I. Osorio, M. G. Frei, D. Sornette, J. Milton, and Y.-C. Lai, ``Epileptic seizures: Quakes of the brain?'' Physical Review E 82, 021919 (2010). X. Ni, W.-X. Wang, Y.-C. Lai, and C. Grebogi, ``Cyclic competition of mobile species on continuous space: pattern formation and coexistence,'' Physical Review E 82, 066211 (2010). X. Ni, R. Yang, W.-X. Wang, Y.-C. Lai, and C. Grebogi, ``Basins of coexistence and extinction in spatially extended ecosystems of cyclically competing species,'' Chaos 20, 045116 (2010). W.-X. Wang, X. Ni, Y.-C. Lai, and C. Grebogi, ``Pattern formation, synchronization and outbreak of biodiversity in cyclically competing games,'' Physical Review E 83, 011917 (2011). I. Osorio and Y.-C. Lai, ``A phase-synchronization and random-matrix based approach to multichannel time-series analysis with application to epilepsy,'' Chaos 21, 033108 (2011). W.-X. Wang, Y.-C. Lai, and D. Armbruster, ``Cascading failures and the emergence of cooperation in evolutionary-game based models of social and economical networks,'' Chaos 21, 033112 (2011). Z.-H. Liu, B. Li, and Y.-C. Lai, ``Enhancing mammalian hearing by a balancing between spontaneous otoacoustic emissions and spatial coupling,'' Europhysics Letters 98, 20005 (2012). L.-L. Jiang, W.-X. Wang, Y.-C. Lai, and X. Ni, ``Multi-armed spirals and multi-pairs antispirals in spatial rock-paper-scissors games,'' Physics Letters A 376, 2292-2297 (2012). J.-Q. Zhang, Z.-G. Huang, J.-Q. Dong, L. Huang, and Y.-C. Lai, ``Controlling collective dynamics in complex, minority-game resource-allocation systems,'' Physical Review E 87, 052808 (2013). J.-P. Park, Y.-H. Do, Z.-G. Huang, and Y.-C. Lai, ``Persistent coexistence of cyclically competing species in spatially extended ecosystems,'' Chaos 23, 023128 (2013). M. Wu, R.-Q. Su, X.-H. Li, T. Ellis, Y.-C. Lai, and X. Wang, ``Engineering of regulated stochastic cell fate determination,'' Proceedings of the National Academy of Sciences (USA) 110, 10610-10615 (2013). B. Schelter, M. Mader, W. Mader, L. Sommerlade, B. Platt, Y.-C. Lai, C. Grebogi, and M. Thiel, ``Overarching framework for data-based modelling,'' Europhysics Letters 105, Article number 30004 (2014). R.-Q. Su, Y.-C. Lai, and X. Wang, ``Identifying chaotic FitzHugh-Nagumo neurons using compressive sensing,'' Entropy 16, 3889-3902 (2014). J.-Q. Dong, Z.-G. Huang, L. Huang, and Y.-C. Lai, ``Triple grouping and period-three oscillations in minority-game dynamics,'' Physical Review E 90, Article number 062917 (2014). L.-Z. Wang, F.-Q. Wu, K. Flores, Y.-C. Lai, and X. Wang, ``Build to understand: synthetic approaches to Biology,'' Integrative Biology 8, 394-408 (2016). J.-Q. Zhang, Z.-G. Huang, Z.-X. Wu, R.-Q. Su, and Y.-C. Lai, ``Controlling herding in minority game systems,'' Scientific Reports 6, Article number 20925 (2016). L. Huang, X. Ni, W. L. Ditto, M. Spano, P. R. Carney, and Y.-C. Lai, ``Detecting and characterizing high frequency oscillations in epilepsy - A case study of big data analysis,'' Royal Society Open Science 4, Article number 160741 (2017). F.-Q. Wu, R.-Q. Su, Y.-C. Lai, and X. Wang, ``Engineering of a synthetic quadrastable gene network to approach Waddington landscape and cell fate determination,'' eLIFE 6, Article number e23702 (2017). J.-P. Park, Y.-H. Do, B.-S. Jang, and Y.-C. Lai, ``Emergence of unusual coexistence states in cyclic game systems,'' Scientific Reports 7, Article number 7465 (2017). A. Hastings, K. C. Abbott, K. Cuddington, T. Francis, G. Gellner, Y.-C. Lai, A. Morozov, S. Petrivskii, K. Scranton, and M. L. Zeeman, ``Transient phenomena in ecology,'' Science 361, eaat6412 (2018). Y.-X. Yao, Z.-T. Bing, L. Huang, Z.-G. Huang, and Y.-C. Lai, ``A network approach to quantifying radiotherapy effect on cancer: radiosensitive gene group centrality,'' Journal of Theoretical Biology 462, 528-536 (2018). L. Gao, C. Grebogi, Y.-C. Lai, J. Stephen, T.-S. Zhang, Y.-L. Li, H.-P. Ren, D.-C. Li, J. Wang, B. Schelter, and L. Sommerlade, ``Quantitative assessment of cerebral connectivity deficiency and cognitive impairment in children with prenatal alcohol exposure,'' Chaos, accepted. Y.-C. Lai, ``Transition from strange nonchaotic to strange chaotic attractors,'' Physical Review E 53, 57-65 (1996). Y.-C. Lai, U. Feudel, and C. Grebogi, ``Scaling behaviors in the transition to chaos in quasiperiodically driven dynamical systems,'' Physical Review E 54, 6070-6073 (1996). T. Yalcinkaya and Y.-C. Lai, ``Blowout bifurcation route to strange nonchaotic attractors,'' Physical Review Letters 77, 5039-5042 (1996). T. Yalcinkaya and Y.-C. Lai, ``Bifurcation to strange nonchaotic attractors,'' Physical Review E 56, 1623-1632 (1997). U. Feudel, A. Witt, Y.-C. Lai, and C. Grebogi, ``Fractal and Wada basin boundaries in quasiperiodically driven systems,'' Physical Review E 58, 3060-3066 (1998). X. Wang, M. Zhan, C.-H. Lai, and Y.-C. Lai, ``Strange nonchaotic attractors in random dynamical systems,'' Physical Review Letters 92, 074102 (2004). X.-G. Wang, Y.-C. Lai, and C. H. Lai, ``Characterization of noise-induced strange nonchaotic attractors,'' Physical Review E 74, 016203 (2006). Y.-C. Lai and C. Grebogi, ``Quasiperiodicity and suppression of multistability in nonlinear dynamical systems,'' European Physics Journal Special Topics 226, 1703-1719 (2017). Y.-C. Lai, D. Lerner and R. Hayden, ``An upper bound for the proper delay time in chaotic time series analysis,'' Physics Letters A 218, 30-34 (1996). Y.-C. Lai and D. Lerner, ``Effective scaling regime for computing the correlation dimension in chaotic time-series analysis,'' Physica D 115, 1-18 (1998). M. Dhamala, Y.-C. Lai, and E. Kostelich, ``Detecting unstable periodic orbits from transient chaotic time series,'' Physical Review E 61, 6485-6489 (2000). E. Bollt, T. Stanford, Y.-C. Lai, and K. Zyczkowski, ``Validity of threshold-crossing analysis of symbolic dynamics from chaotic time series,'' Physical Review Letters 85, 3524-3527 (2000). E. Bollt, T. Stanford, Y.-C. Lai, and K. Zyczkowski, ``What symbolic dynamics do we get with a misplaced partition? - On the validity of threshold crossings analysis of chaotic time series,'' Physica D 154, 259-286 (2001). M. Dhamala, Y.-C. Lai, and E. J. Kostelich, ``Analysis of transient chaotic time series,'' Physical Review E 64, 056207 (2001). Y.-C. Lai and E. Kostelich, ``Detectability of dynamical coupling from delay-coordinate embedding of scalar time series,'' Physical Review E 66, 036217 (2002). Y.-C. Lai and N. Ye, ``Recent developments in chaotic time series analysis,'' International Journal of Bifurcation and Chaos 13, 1383-1422 (2003). Y.-C. Lai, M. Frei, and I. Osorio, ``Detecting and characterizing phase synchronization in nonstationary dynamical systems,'' Physical Review E 73, 026214 (2006). L. Zhu, Y.-C. Lai, M. Shah, and S. Mahmood, ``Efficiency of carrier-phase integer ambiguity resolution for precise GPS positioning in noisy environments,'' Journal of Geodesy 81, 149-156 (2007). L. Huang and Y.-C. Lai, ``Sequential Monte Carlo scheme for Bayesian estimation in the presence of data outliers,'' Physical Review E 75, 056705 (2007). C.-T. Zhou, T.-X. Cai, C. H. Lai, X.-G. Wang, and Y.-C. Lai, ``Model-based detector and extraction of weak signal frequencies from chaotic data,'' Chaos 18, 013104 (2008). Z.-K. Gao, N.-D. Jin, W.-X. Wang, and Y.-C. Lai, ``Phase characterization of experimental gas-liquid two-phase flows,'' Physics Letters A 374, 4014-4017 (2010). W.-X. Wang, R. Yang, Y.-C. Lai, V. Kovanis, and C. Grebogi, ``Predicting catastrophes in nonlinear dynamical systems by compressive sensing,'' Physical Review Letters 106, 154101 (2011). R.-Q. Su, X. Ni, W.-X. Wang, and Y.-C. Lai, ``Forecasting synchronizability of complex networks from data,'' Physical Review E 85, 056220 (2012). R. Yang, Y.-C. Lai, and C. Grebogi, ``Forecasting the future: is it possible for time-varying nonlinear dynamical systems?'' Chaos 22, 033119 (2012). J.-J. Jiang, Z.-G. Huang, L. Huang, H. Liu, and Y.-C. Lai, ``Directed dynamical influence is more detectable with noise,'' Scientific Reports 6, Article number 24088 (2016). H.-F. Ma, S.-Y. Leng, C.-Y. Tao, X. Ying, J. Kurths, Y.-C. Lai, and W. Lin, ``Accurate detection of time delays and directional interactions based on time series from complex dynamical systems,'' Physical Review E 96, Article number 012221 (2017). J.-J. Jiang, Y.-Z. Chen, Z.-G. Huang, and Y.-C. Lai, ``Evolutionary hypergame dynamics,'' Physical Review E 98, 042305 (2018). Y.-C. Lai, Y. Nagai, and C. Grebogi, ``Characterization of the natural measure by unstable periodic orbits in chaotic attractors,'' Physical Review Letters 79, 649-652 (1997). Y. Nagai and Y.-C. Lai, ``Periodic-orbit theory of the blowout bifurcation,'' Physical Review E 56, 4031-4041 (1997). Y.-C. Lai, ``Characterization of the natural measure by unstable periodic orbits in nonhyperbolic chaotic systems,'' Physical Review E 56, 6531-6539 (1997). X. Pei, K. Dolan, F. Moss, and Y.-C. Lai, ``Counting unstable periodic orbits in noisy chaotic systems: a scaling relation connecting experiment with theory,'' Chaos 8, 853-860 (1998). R. L. Davidchack and Y.-C. Lai, ``An efficient algorithm for detecting unstable periodic orbits in chaotic systems,'' Physical Review E 60, 6172-6175 (1999). M. Dhamala and Y.-C. Lai, ``Unstable periodic orbits and the natural measure of nonhyperbolic chaotic saddles,'' Physical Review E 60, 6176-6179 (1999). R. Davidchack, Y.-C. Lai, E. Bollt, and M. Dhamala, ``Estimating the generating partition of chaotic systems by unstable periodic orbits,'' Physical Review E 61, 1353-1356 (2000). R. Davidchack and Y.-C. Lai, ``Characterization of transition to chaos with multiple positive Lyapunov exponents by unstable periodic orbits,'' Physics Letters A 270, 308-313 (2000). R. L. Davidchack, Y.-C. Lai, A. Klebanoff, and E. M. Bollt, ``Toward complete detection of unstable periodic orbits in chaotic systems,'' Physics Letters A 287, 99-104 (2001). M. Dhamala and Y.-C. Lai, ``The natural measure of nonattracting chaotic sets and its representation by unstable periodic orbits,'' International Journal of Bifurcation and Chaos 12, 2991-3006 (2002). A. Deshpande, Q.-F. Chen, Y. Wang, Y.-C. Lai, and Y.-H. Do, ``Effect of smoothing on robust chaos,'' Physical Review E 82, 026209 (2010). H.-F. Ma, W. Lin, and Y.-C. Lai, ``Detecting unstable periodic orbits in high-dimensional chaotic systems from time series: reconstruction meeting with adaptation,'' Physical Review E (Rapid Communications) 87, 050901(R) (2013). H.-F. Ma, D. W. C. Ho, Y.-C. Lai, and W. Lin, ``Detection meeting control: unstable steady states in high-dimensional nonlinear dynamical systems,'' Physical Review E 92, Article number 042902 (2015). Y.-C. Lai and C. Grebogi, ``Complexity in Hamiltonian-driven dissipative chaotic dynamical systems,'' Physical Review E 54, 4667-4676 (1996). E. Bollt, Y.-C. Lai, and C. Grebogi, ``Coding, channel capacity, and noise resistance in communicating with chaos,'' Physical Review Letters 79, 3787-3790 (1997). T. Yalcinkaya and Y.-C. Lai, ``Phase characterization of chaos,'' Physical Review Letters 79, 3885-3888 (1997). E. Bollt and Y.-C. Lai, ``Dynamics of coding in communicating with chaos,'' Physical Review E 58, 1724-1736 (1998). Y.-C. Lai, ``Analytic signals and transition to chaos in deterministic flows,'' Physical Review E (Rapid Communications) 58, R6911-R6914 (1998). Y.-C. Lai, E. Bollt, and C. Grebogi, ``Communicating with chaos using two-dimensional symbolic dynamics,'' Physics Letters A 255, 75-81 (1999). Y.-C. Lai, ``Unstable dimension variability and complexity in chaotic systems,'' Physical Review E (Rapid Communications) 59, R3807-R3810 (1999). Y.-C. Lai ``Encoding digital information using transient chaos,'' International Journal of Bifurcation and Chaos 10, 787-795 (2000). M. S. Baptista, E. E. Macau, C. Grebogi, Y.-C. Lai, and E. Rosa, ``Integrated chaotic communication scheme,'' Physical Review E 62, 4835-4845 (2000). L. Zhu, Y.-C. Lai, F. Hoppensteadt, and E. M. Bollt, ``Numerical and experimental investigation of the effect of filtering on chaotic symbolic dynamics,'' Chaos 13, 410-419 (2003). N. Ye, Y.-C. Lai, and T. Farley, ``Dependable information infrastructures as complex adaptive systems,'' Systems Engineering 6, 225-237 (2003). N. Ye, E. S. Gel, X. Li, T. Farley, and Y.-C. Lai, ``Web server QoS models: applying scheduling rules from production planning,'' Computers & Operations Research 32, 1147-1164 (2005). N. Ye, Z.-B. Yang, Y.-C. Lai, and T. Farley, ``Enhancing Router QoS through job scheduling with weighted shortest processing time adjusted,'' Computers & Operations Research 32, 2255-2269 (2005). X. Wang, M. Zhan, X. Gong, C. H. Lai, and Y.-C. Lai, ``Spread-spectrum communication using binary spatiotemporal chaotic codes,'' Physics Letters A 334, 30-36 (2005). Z. Yang, N. Ye, and Y.-C. Lai, ``QoS model of router with feedback control,'' Quality and Reliability Engineering International 42, 429-444 (2006). H. Yang, G.-P. Jiang, W. K. S. Tang, G.-R. Chen, and Y.-C. Lai, ``Multi-carrier differential chaos shift keying system with subcarriers allocation for noise reduction,'' IEEE Transactions on Circults and Systems II: Express Briefs 65, 1733-1737 (2018). Y.-C. Lai, C. Grebogi, and J. Kurths, ``Modeling of deterministic chaotic systems,'' Physical Review E 59, 2907-2910 (1999). Y.-C. Lai and C. Grebogi, ``Modeling of coupled chaotic oscillators,'' Physical Review Letters 82, 4803-4806 (1999). Y.-C. Lai, D. Lerner, K. Williams, and C. Grebogi, ``Unstable dimension variability in coupled chaotic oscillators,'' variability in coupled chaotic oscillators,'' Physical Review E 60, 5445-5454 (1999). Y.-C. Lai and C. Grebogi, ``Obstruction to deterministic modeling of chaotic systems with invariant manifold,'' International Journal of Bifurcation and Chaos 10, 683-693 (2000). Y.-C. Lai, Z. Liu, W.-G. Wei, and C.-H. Lai, ``Shadowability of statistical averages in chaotic systems,'' Physical Review Letters 89, 184101 (2002). Y.-H. Do, Y.-C. Lai, Z. Liu, and E. J. Kostelich, ``Universal and nonuniversal scaling in shadowing dynamics of nonhyperbolic chaotic systems with unstable dimension variability,'' Physical Review E (Rapid Communications) 67, 035202 (2003). Y.-H. Do and Y.-C. Lai, ``Statistics of shadowing time in nonhyperbolic chaotic systems with unstable dimension variability,'' Physical Review E 69, 016213 (2004). Y.-C. Lai, Z. Liu, G.-W. Wei, C. H. Lai, ``Reply to ``Comment on `Shadowability of statistical averages in chaotic systems,' '' Physical Review Letters 94, 219403 (2005). Z. Liu and Y.-C. Lai, ``Coherence resonance in coupled chaotic systems,'' Physical Review Letters 86, 4737-4740 (2001). Y.-C. Lai and Z. Liu, ``Noise enhanced temporal regularity in coupled chaotic oscillators,'' Physical Review E 64, 066202 (2001). H. Kantz, C. Grebogi, A. Prasad, Y.-C. Lai, and E. Sinde, ``Unexpected robustness of a class of nonhyperbolic chaotic attractors against noise,'' Physical Review E 65, 026209 (2002). Z. Liu, Y.-C. Lai, L. Billings, and I. B. Schwartz, ``Transition to chaos in continuous-time random dynamical systems,'' Physical Review Letters 88, 124101 (2002). Z. Liu, Y.-C. Lai, and A. Nachman, ``Enhancement of noisy signals by stochastic resonance,'' Physics Letters A 297, 75-80 (2002). M. Zhan, G.-W. Wei, C.-H. Lai, Y.-C. Lai, and Z. Liu, ``Coherence resonance near Hopf bifurcation in coupled chaotic oscillators,'' Physical Review E 66, 036201 (2002). Y.-C. Lai, Z. Liu, L. Billings, and I. B. Schwartz, ``Noise-induced unstable dimension variability and transition to chaos in continuous-time random dynamical systems,'' Physical Review E 67, 026210 (2003). Y.-C. Lai and Z. Liu, ``Effect of noise on the neutral direction of chaotic attractor,'' Chaos 14, 189-192 (2004). I. B. Schwartz, D. S. Morgan, L. Billings, and Y.-C. Lai, ``Multi-scale continuum mechanics: From global bifurcations to noise-induced high-dimensional chaos,'' Chaos 14, 373-386 (2004). K. Park, Y.-C. Lai, Z. Liu, and A. Nachman, ``Aperiodic stochastic resonance and phase synchronization,'' Physics Letters A 326, 391-396 (2004). Z. Liu, Y.-C. Lai, and A. Nachman, ``Enhancement of detectability of noisy signals by stochastic resonance in arrays,'' International Journal of Bifurcation and Chaos 14, 1655-1670 (2004). Y.-C. Lai, Z. Liu, A. Nachman, and L. Zhu, ``Suppression of jamming in excitable systems by aperiodic stochastic resonance,'' International Journal of Bifurcation and Chaos 14(10), 3519-3539 (2004). K. Park and Y.-C. Lai, ``Characterization of stochastic resonance,'' Europhysics Letters 70, 432-438 (2005). K, Park, Y.-C. Lai, and S. Krishnamoorthy, ``Noise sensitivity of phase-synchronization time in stochastic resonance: Theory and experiment,'' Physical Review E 75, 046205 (2007). Y.-C. Lai, K. Park, and L. Rajagopalan, ``Stochastic resonance and energy optimization in spatially extended dynamical systems,'' European Journal of Physics B 69, 65-70 (2009). Y. Wang, Y.-C. Lai, and Z.-G. Zheng, ``Onset of colored-noise-induced synchronization in chaotic systems,'' Physical Review E 79, 056210 (2009). Y. Wang, Y.-C. Lai, and Z.-G. Zheng, ``Route to noise-induced synchronization in an ensemble of uncoupled chaotic systems,'' Physical Review E 81, 036201 (2010). S. Taherion and Y.-C. Lai, ``Observability of lag synchronization in coupled chaotic oscillators,'' Physical Review E (Rapid Communications) 59, R6247-R6250 (1999). S. Taherion and Y.-C. Lai, ``Experimental observation of lag synchronization in coupled chaotic systems,'' International Journal of Bifurcation and Chaos 10, 2587-2594 (2000). L. Zhu, A. Raghu, and Y.-C. Lai, ``Experimental observation of super-persistent chaotic transients,'' Physical Review Letters 86, 4017-4020 (2001). L. Zhu and Y.-C. Lai, ``Experimental observation of generalized time-lagged chaotic synchronization,'' Physical Review E (Rapid Communications) 64, 045205 (2001). L. Zhu, Y.-C. Lai, Z. Liu, and A. Raghu, ``Can noise make non-bursting chaotic systems more regular?'' Physical Review E(Rapid Communications) 66, 015204 (2002). B. Xu, Y.-C. Lai, L. Zhu, and Y.-H. Do, ``Experimental characterization of transition to chaos in the presence of noise,'' Physical Review Letters 90, 164101 (2003). Y.-C. Lai, A. Kandangath, S. Krishnamoorthy, J. A. Gaudet, and A. P. S. de Moura, ``Inducing chaos by resonant perturbations: theory and experiment,'' Physical Review Letters 94, 214101 (2005). A. Kandangath, S. Krishnamoorthy, Y.-C. Lai, and J. A. Gaudet, ``Inducing chaos in electronic circuits by resonant perturbations,'' IEEE Transactions on Circuits and Systems I 54, 1109-1119 (2007). S. Gopal and Y.-C. Lai, ``Inducing chaos in MOSFET-based electronic circuits,'' Journal of Circuits, Systems and Signal Processing 28, 535-545 (2009). Z. Liu, Y.-C. Lai, and N. Ye, ``Statistical properties and attack tolerance of growing networks with algebraic preferential attachment,'' Physical Review E 66, 036112 (2002). Z. Liu, Y.-C. Lai, N. Ye, and P. Dasgupta, ``Connectivity distribution and attack tolerance of general networks with both preferential and random attachments,'' Physics Letters A 303, 337-344 (2002). T. Nishikawa, A. E. Motter, Y.-C. Lai, and F. Hoppensteadt, ``Smallest small-world network,'' Physical Review E 66, 046139 (2002). T. Nishikawa, A. E. Motter, Y.-C. Lai, and F. Hoppensteadt, ``Heterogeneity in oscillator networks: Are smaller worlds easier to synchronize?'' Physical Review Letters 91, 014101 (2003). A. P. S. de Moura, Y.-C. Lai, and A. E. Motter, ``Signatures of small-world and scale-free properties of large computer programs,'' Physical Review E 68, 017102 (2003). Y.-C. Lai, Z. Liu, and N. Ye, ``Infection propagation on growing networks,'' International Journal of Modern Physics B 17, 4045-4061 (2003). K. Park, Y.-C. Lai, and N. Ye, ``Characterization of weighted complex networks,'' Physical Review E 70, 026109 (2004). L. Zhao, K. Park, and Y.-C. Lai, ``Attack vulnerability in scale-free networks due to cascading breakdown,'' Physical Review E (Rapid Communications) 70, 035101(R) (2004). L. Zhao, Y.-C. Lai, K. Park, and N. Ye, ``Onset of traffic congestion in complex networks,'' Physical Review E 71, 026125 (2005). K. Park, Y.-C. Lai, and N. Ye, ``Self-organized scale-free networks,'' Physical Review E 72, 026131 (2005). L. Zhao, K. Park, Y.-C. Lai, and N. Ye, ``Tolerance of scale-free networks against attack-induced cascades,'' Physical Review E (Rapid Communications) 72, 025104 (2005). Y.-C. Lai, A. E. Motter, T. Nishikawa, K. Park, and L. Zhao, ``Complex networks: dynamics and security,'' Pramana - Journal of Physics 64, 483-502 (2005). L. Huang, K. Park, and Y.-C. Lai, ``Information propagation on modular networks,'' Physical Review E (Rapid Communications) 73, 035103(R) (2006). L. Huang, Y.-C. Lai, K. Park, and J.-S. Zhang, ``Percolation and blind spots in complex networks,'' Physical Review E 73, 066131 (2006). L. Huang, K. Park, Y.-C. Lai, L. Yang, and K.-Q. Yang, ``Abnormal synchronization in complex clustered networks,'' Physical Review Letters 97, 164101 (2006). X.-G. Wang, Y.-C. Lai, and C. H. Lai, ``Oscillations of complex networks,'' Physical Review E 74, 066104 (2006). K. Park, L. Huang, and Y.-C. Lai, ``Desynchronization waves in small-world networks,'' Physical Review E 75, 026211 (2007). X.-G. Wang, Y.-C. Lai, and C. H. Lai, ``Enhancing synchronization based on complex gradient networks,'' Physical Review E 75, 056205 (2007). L. Huang, Y.-C. Lai, K. Park, J.-S. Zhang, and Z. Hu, ``Critical behavior of blind spots in sensor networks,'' Chaos 17, 023132 (2007). L. Zhao, T. H. Cupertino, K. Park, Y.-C. Lai, and X. Jin, ``Optimal structure of complex networks for minimizing traffic congestion,'' Chaos 17, 043103 (2007). L. Huang, Y.-C. Lai, K. Park, X.-G. Wang, C. H. Lai, and R. A. Gatenby, ``Synchronization in complex clustered networks,'' Frontiers of Physics in China 2, 446-459 (2007). R. Yang, L. Huang, and Y.-C. Lai, ``Selectivity-based spreading dynamics on complex networks,'' Physical Review E 78, 026111 (2008). X.-G. Wang, L. Huang, S.-G. Guan, Y.-C. Lai, and C. H. Lai, ``Onset of synchronization in complex gradient networks,'' Chaos 18, 037117 (2008). L. Huang, Y.-C. Lai, and G.-R. Chen, ``Understanding and preventing cascading breakdown in complex clustered networks,'' Physical Review E 78, 036116 (2008). L. Huang, Y.-C. Lai, and R. A. Gatenby, ``Dynamics based scalability of complex networks,'' Physical Review E (Rapid Communications) 78, 045102(R) (2008). X.-J. Ma, L. Huang, Y.-C. Lai, Y. Wang, and Z.-G. Zheng, ``Synchronization-based scalability in complex clustered networks,'' Chaos 18, 043109 (2008). R. Yang, T. Zhou, Y.-B. Xie, Y.-C. Lai, and B.-H. Wang, ``Optimal contact process on complex networks,'' Physical Review E 78, 066109 (2008). R. Yang, W.-X. Wang, Y.-C. Lai, and G.-R. Chen, ``Optimal weighting scheme for suppressing cascades and traffic congestion in complex networks,'' Physical Review E 79, 026112 (2009). W.-X. Wang, L. Huang, Y.-C. Lai, and G.-R. Chen, ``Onset of synchronization in weighted scale-free networks,'' Chaos 19, 013134 (2009). This paper was one of Chaos' monthly top 20 most-downloaded articles in 2010. R. Yang, L. Huang, and Y.-C. Lai, ``Transient disorder in dynamically growing networks,'' Physical Review E 79, 046101 (2009). X.-J. Ma, L. Huang, Y.-C. Lai, and Z.-G. Zheng, ``Emergence of loop structure in scale-free networks and dynamical consequences,'' Physical Review E 79, 056106 (2009). H.-X. Yang, W.-X. Wang, Z.-X. Wu, Y.-C. Lai, and B.-H. Wang, ``Diversity-optimized cooperation on complex networks,'' Physical Review E 79, 056107 (2009). W.-X. Wang, Q.-F. Chen, L. Huang, Y.-C. Lai, and M. A. F. Harrison, ``Scaling of noisy fluctuations in complex networks and applications to network detection,'' Physical Review E 80, 016116 (2009). W.-X. Wang, L. Huang, and Y.-C. Lai, ``Universal dynamics on complex networks,'' Europhysics Letters 87, 18006 (2009). W.-X. Wang, Z.-X.Wu, R. Jiang, G.-R. Chen, and Y.-C. Lai, ``Abrupt transition to complete congestion on complex networks and control,'' Chaos 19, 033106 (2009). W.-X. Wang and Y.-C. Lai, ``Abnormal cascading on complex networks,'' Physical Review E 80, 036109 (2009). X.-G. Wang, S.-G. Guan, Y.-C. Lai, B. Li, and C. H. Lai, ``Desynchronization and on-off intermittency in complex networks,'' Europhysics Letters 88, 28001 (2009). J. Ren, W.-X. Wang, B. Li, and Y.-C. Lai, ``Noise bridges dynamical correlation and topology in complex oscillator networks,'' Physical Review Letters 104, 058701 (2010). X.-J. Ma, W.-X. Wang, Y.-C. Lai, and Z.-G. Zheng, ``Information explosion on complex networks and control,'' European Journal of Physics B 76, 179-183 (2010). H.-X. Yang, W.-X. Wang, Y.-B. Xie, Y.-C. Lai, and B.-W. Wang, ``Transportation dynamics on networks of mobile agents,'' Physical Review E 83, 016102 (2011). R.-R. Liu, W.-X. Wang, Y.-C. Lai, G.-R. Chen, and B.-H. Wang, ``Optimal convergence in naming game with geography-based negotiation on small-world networks,'' Physics Letters A 375, 363-367 (2011). L.-L. Jiang, M. Perc, W.-X. Wang, Y.-C. Lai, and B.-H. Wang, ``Impact of link deletions on public cooperation in scale-free networks,'' Europhysics Letters 93, 40001 (2011). W.-X. Wang, R. Yang, Y.-C. Lai, V. Kovanis, and M. A. F. Harrison, ``Time-series based prediction of complex oscillator networks via compressive sensing,'' Europhysics Letters 94, 48006 (2011). L. Huang and Y.-C. Lai, ``Cascading dynamics in complex quantum networks,'' Chaos 21, 025107 (2011). H.-X. Yang, W.-X. Wang, Y.-C. Lai, Y.-B. Xie, and B.-H. Wang, ``Control of epidemic spreading on complex networks by local traffic dynamics,'' Physical Review E (Rapid Communication) 84, 045010(R), 1-4 (2011). W.-X. Wang, Y.-C. Lai, C. Grebogi, and J.-P. Ye, ``Network reconstruction based on evolutionary-game data'' Physical Review X 1, 021021, 1-7 (2011). H.-X. Yang, W.-X. Wang, Y.-C. Lai, and B.-H. Wang, ``Convergence to global consensus in opinion dynamics under a nonlinear voter model,'' Physics Letters A 376, 282-285 (2012). R.-R. Liu, W.-X. Wang, Y.-C. Lai, and B.-H. Wang, ``Cascading dynamics on random networks: Crossover in phase transition,'' Physical Review E 85, 026110 (2012). W.-X. Wang, X. Ni, Y.-C. Lai, and C. Grebogi, ``Optimizing controllability of complex networks by minimum structural perturbations,'' Physical Review E 85, 026115 (2012). G.-M. Zhu, H.-J. Yang, R. Yang, J. Ren, B. Li, and Y.-C. Lai, ``Uncovering evolutionary ages of nodes in complex networks,'' European Journal of Physics B 85, 106 (2012). G. Yan, J. Ren, Y.-C. Lai, C. H. Lai, and B. Li, ``Controlling complex networks: How much energy is needed?'' 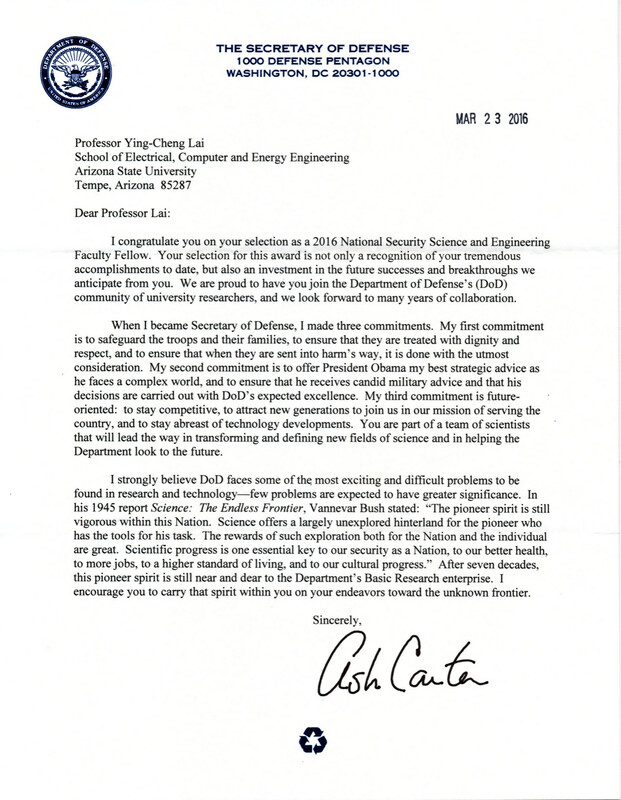 Physical Review Letters 108, 218703 (2012). H.-X. Yang, W.-X. Wang, Y.-C. Lai and B.-H. Wang, ``Traffic-driven epidemic spreading on networks of mobile agents,'' Europhysics Letters 98, 68003 (2012). R.-Q. Su, W.-X. Wang, and Y.-C. Lai, ``Detecting hidden nodes in complex networks from time series,'' Physical Review E 85, 065201(R) (2012). H.-X. Yang, W.-X. Wang, Y.-C. Lai, and C. Grebogi, ``The emergence and evolution of cooperation on complex networks,'' International Journal of Bifurcation and Chaos, 22, 1250228 (2012). F. Ricci, R. Tonelli, L. Huang, and Y.-C. Lai, ``Onset of chaotic phase synchronization in complex networks of coupled heterogeneous oscillators,'' Physical Review E 86, 027201 (2012). W.-X. Wang, J. Ren, Y.-C. Lai, and B. Li, ``Reverse engineering of complex dynamical networks in the presence of time-delayed interactions based on noisy time series,'' Chaos 22, 033131 (2012). Z.-G. Huang, J.-Q. Zhang, J.-Q. Dong, L. Huang, and Y.-C. Lai, ``Emergence of grouping in multi-resource minority game dynamics,'' Nature Scientific Reports 2, 703; DOI:10.1038/srep00703 (2012). Y.-Z. Chen and Y.-C. Lai, ``Optimizing cooperation on complex networks in the presence of failure,'' Physical Review E (Rapid Communications) 86, 045101(R) (2012). L. Huang, Y.-C. Lai, and M. A. F. Harrison, ``Probing complex networks from measured time series,'' International Journal of Bifurcation and Chaos 22, 1250236 (2012). H.-X. Yang, W.-X. Wang, and Y.-C. Lai, ``Traffic-driven epidemic outbreak on complex networks: how long does it take?'' Chaos 22, 043146 (2012). Z. Zhou, Z.-G. Huang, L. Huang, Y.-C. Lai, L. Yang, and D.-S. Xue, ``Universality of flux-fluctuation law in complex dynamical systems,'' Physical Review E 87, 012808 (2013). Z.-Z. Yuan, C. Zhao, Z.-R. Di, W.-X. Wang, and Y.-C. Lai, ``Exact controllability of complex networks,'' Nature Communications 4, 2447 (1-9) (2013). B. S. Kim, Y.-H. Do, and Y.-C. Lai, ``Emergence and scaling of synchronization in moving-agent networks with restrictive interactions,'' Physical Review E 88, 042818 (2013). K. Gong, M. Tang, P. M. Hui, Y.-H. Do, and Y.-C. Lai, ``An efficient immunization strategy for community networks,'' PLoS One 8, e83489 (2013). N. Yao, Z.-G. Huang, Y.-C. Lai, and Z.-G. Zheng, ``Robustness of chimera states in complex dynamical systems,'' Scientific Reports 3, Article number 3522 (2013). R.-Q. Su, Y.-C. Lai, X. Wang, and Y.-H. Do, ``Uncovering hidden nodes in complex network in the presence of noise,'' Scientific Reports 4, Article number 3944 (2014). W. Wang, M. Tang, H. Yang, Y.-H. Do, Y.-C. Lai, and G.-W. Lee, ``Asymmetrically interacting spreading dynamics on complex layered networks,'' Scientific Reports 4, Article number 5097 (2014). Z.-S. Shen, W.-X. Wang, Y. Fan, Z.-R. Di, and Y.-C. Lai, ``Reconstructing propagation networks with natural diversity and identifying hidden source,'' ``Supporting Information'' Nature Communications 5, Article number 4323 (2014). H.-F. Zhang, Z.-X. Wu, M. Tang, and Y.-C. Lai, ``Effects of behavioral response and vaccination policy on epidemic spreading - an approach based on evolutionary-game dynamics,'' Scientific Reports 4, Article number 5666 (2014). Y.-C. Lai, ``Controlling complex, nonlinear dynamical networks,'' National Science Review 1, 339-341 (2014). Y.-Z. Chen, Z.-G. Huang, and Y.-C. Lai, ``Controlling extreme events on complex networks,'' Scientific Reports 4, Article number 6121 (2014). H.-F. Zhang, J.-R. Xie, M. Tang, and Y.-C. Lai, ``Suppression of epidemic spreading in complex networks by local information based behavioral responses,'' Chaos 24, Article number 043106 (2014). Z.-G. Huang, J.-Q. Dong, L. Huang, and Y.-C. Lai, ``Universal flux-fluctuation law in small systems,'' Scientific Reports 4, Article number 6787 (2014). L.-Z. Wang, Z.-G. Huang, Z.-H. Rong, X.-F. Wang, and Y.-C. Lai, ``Emergence, evolution and scaling of online social networks,'' PLoS ONE 9, Article number e111013 (2014). Z.-Z. Yuan, C. Zhao, W.-X. Wang, Z.-R. Di, and Y.-C. Lai, ``Exact controllability of multiplex networks,'' New Journal of Physics 16, Article number 103036 (2014). Z.-D. Zhao, Z.-G. Huang, L. Huang, H. Liu, and Y.-C. Lai, ``Scaling and correlation of human movements in cyberspace and physical space,'' Physical Review E (Rapid Communications) 90, Article number 050802(R) (2014). H.-Y. Zheng, N. Yao, Z.-G. Huang, J. Park, Y.-H. Do, and Y.-C. Lai, ``Mesoscopic interactions and species coexistence in evolutionary game dynamics of cyclic competitions,'' Scientific Reports 4, Article number 7486 (2014). H.-X. Yang, Z.-X. Wu, Z.-H. Rong, and Y.-C. Lai, ``Peer pressure: enhancement of cooperation through mutual punishment,'' Physical Review E 91, Article number 022121 (2015). Y.-Z. Chen, Z.-G. Huang, S.-H. Xu, and Y.-C. Lai, ``Spatiotemporal patterns and predictability of cyberattacks,'' PLoS ONE 10, Article number e0124472 (2015). H.-X. Yang, M. Tang, and Y.-C. Lai, ``Traffic-driven epidemic spreading in correlated networks,'' Physical Review E 91, Article number 062817 (2015). S.-P. Zhang, Z.-G. Huang, J.-Q. Dong, D. Eisenberg, T. P. Seager, and Y.-C. Lai, ``Optimization and resilience of complex supply-demand networks,'' New Journal of Physics 17, Article number 063029 (2015). W. Wang, M. Tang, H.-F. Zhang, and Y.-C. Lai, ``Dynamics of social contagions with memory of nonredundant information,'' Physical Review E 92, Article number 012820 (2015). W.-J. Lin, Y.-F. Wang, H.-P. Ying, Y.-C. Lai, and X.-G. Wang, ``Consistency between functional and structural networks of coupled nonlinear oscillators,'' Physical Review E 92, Article number 012912 (2015). N. Yao, Z.-G. Huang, C. Grebogi, and Y.-C. Lai, ``Emergence of multicluster chimera states,'' Scientific Reports 5, Article number 12988 (2015). Q.-H. Chen, Z.-G. Huang, Y.-G. Wang, and Y.-C. Lai, ``Multiagent model and mean field theory of complex auction dynamics,'' New Journal of Physics 17, Article number 093003 (2015). Y.-Z. Chen, Z.-G. Huang, H.-F. Zhang, D. Eisenberg, T. P. Seager, and Y.-C. Lai, ``Extreme events in multilayer, interdependent complex networks and control,'' Scientific Reports 5, Article number 17277 (2015). R.-Q. Su, W.-X. Wang, X. Wang, and Y.-C. Lai, ``Data based reconstruction of complex geospatial networks, nodal positioning, and detection of hidden node,'' Royal Society Open Science 3, Article number 150577 (2016). L.-Z. Wang, R.-Q. Su, Z.-G. Huang, X. Wang, W.-X. Wang, C. Grebogi, and Y.- C. Lai, ``A geometrical approach to control and controllability of nonlinear dynamical networks,'' Nature Communications 7, Article number 11323 (2016). Y.-Z. Chen, L.-Z. Wang, W.-X. Wang, and Y.-C. Lai, ``Energy scaling and reduction in controlling complex networks,'' Royal Society Open Science 3, Article number 160064 (2016). Y.-F. Wang, H.-W. Fan, W.-J. Lin, Y.-C. Lai, and X.-G. Wang, ``Growth, collapse, and self-organized criticality in complex networks,'' Scientific Reports 6, Article number 24445 (2016). Y.-M. Zhao, A. Zeng, X.-Y. Yan, W.-X. Wang, and Y.-C. Lai, ``Unified underpinning of human mobility in the real world and cyberspace,'' New Journal of Physics 18, Article number 053025 (2016). X.-D. Gao, W.-X. Wang, and Y.-C. Lai, ``Control efficacy of complex networks,'' Scientific Reports 6, Article number 28037 (2016). W.-X. Wang, Y.-C. Lai, and C. Grebogi, ``Data based identification and prediction of nonlinear and complex dynamical systems,'' Physics Reports 644, 1-76 (2016). X. Han, Z.-S. Shen, W.-X. Wang, Y.-C. Lai, and C. Grebogi, ``Reconstructing direct and indirect interactions in networked public goods game,'' Scientific Reports 6, Article number 30241 (2016). L.-Z. Wang, Y.-Z. Chen, W.-X. Wang, and Y.-C. Lai, ``Physical controllability of complex networks,'' Scientific Reports 7, Article number 40198 (2017). J.-W. Li, Z.-S. Shen, W.-X. Wang, C. Grebogi, and Y.-C. Lai, ``Universal data-based method for reconstructing complex networks with binary-state dynamics,'' Physical Review E 95, Article number 032203 (2017). Z.-L. Hu, X. Han, Y.-C. Lai, and W.-X. Wang, ``Optimal localization of diffusion sources in complex networks,'' Royal Society Open Science 4, Article number 170091 (2017). Q.-H. Liu, W. Wang, M. Tang, T. Zhou, and Y.-C. Lai, ``Explosive spreading on complex networks: the role of synergy,'' Physical Review E 95, Article number 042320 (2017). C. Ma, H.-F. Zhang, and Y.-C. Lai, ``Reconstructing complex networks without time series,'' Physical Review E 96, Article number 022320 (2017). H.-W. Fan, Y.-F. Wang, H.-T. Wang, Y.-C. Lai, and X.-G. Wang, ``Autapses promote synchronization in neuronal networks,'' Scientific Reports 8, Article number 580 (2017). R.-R. Liu, D. Eisenberg, T. P. Seager, and Y.-C. Lai, ``The `weak' interdependence of infrastructure systems produces mixed percolation transitions in multilayer networks,'' Scientific Reports 8, Article number 2111 (2017). C. Ma, H.-S. Chen, Y.-C. Lai, and H.-F. Zhang, ``Statistical inference approach to structural reconstruction of complex networks from binary time series,'' Physical Review E 97, Article number 022301 (2018). Q.-H. Liu, W. Wang, S.-M. Cai, M. Tang, and Y.-C. Lai, ``Synergistic interactions promote behavior spreading and alter phase transition on multiplex networks,'' Physical Review E 97, Article number 022311 (2018). Y.-Z. Chen and Y.-C. Lai, ``Sparse dynamical Boltzmann machine for reconstructing complex networks with binary dynamics,'' Physical Review E 97, Article number 032317 (2018). H.-W. Fan, Y.-C. Lai, and X.-G. Wang, ``Enhancing network synchronization by phase modulation,'' Physical Review E 98, Article number 012212 (2018). Y.-F. Wang, D.-M. Song, X. Gao, S.-X. Qu, Y.-C. Lai, and X.-G. Wang, ``Effect of network structural perturbations on spiral wave patterns,'' Nonlinear Dynamics 93, 1671-1680 (2018). P.-B. Cui, W. Wang, S.-M. Cai, T. Zhou, and Y.-C. Lai, ``Close and ordinary social contacts: How important are they in promoting large-scale contagion?'' , Physical Review E 98, 052311 (2018). N. Yao, Z.-G. Huang, H.-P. Ren, C. Grebogi, and Y.-C. Lai, ``Self adaptation of chimera states,'' Physical Review E (Rapid Communication) 99, 010201(R) (2019). L.-Z. Wang, Z.-D. Zhao, J.-J. Jiang, B.-H. Guo, X. Wang, Z.-G. Huang, and Y.-C. Lai, ``A model for meme popularity growth in social networking systems based on biological principle and human interest dynamics,'' Chaos 29, 023136 (2019). C.-W. Su, Z.-G. Huang, W.-X. Wang, J. Wang, X.-F. Wang, and Y.-C. Lai, ``Optimizing optimization: accurate detection of hidden interactions in active body systems from noisy data,'' Nonlinear Dynamics (2019). S.-P. Zhang, J.-Q. Dong, L. Liu, Z.-G. Huang, L. Huang, and Y.-C. Lai, ``Reinforcement learning meets minority game: Toward optimal resource allocation,'' Physical Review E 99, 032302 (2019). R.-R. Liu, C.-X. Jia, and Y.-C. Lai, ``Remote control of cascading dynamics on complex multilayer networks,'' New Journal of Physics, accepted. Y.-C. Lai, C. Grebogi and J. A. Yorke, ``Sudden change in the size of chaotic attractors: how does it occur?,'' pp. 441-455 in Applied Chaos, edited by J. H. Kim and J. Stringer, John Wiley & Sons, 1992. Y.-C. Lai, M. Ding and C. Grebogi, ``Controlling chaos in Hamiltonian systems,'' pp. 129-137 in Future Directions of Nonlinear Dynamics in Physical and Biological Systems, Plenum Publishing Co. Ltd., England, 1992. Y.-C. Lai and C. Grebogi, ``Synchronization of a chaotic optical system using control,'' pp. 91-102 in Chaos in Communications, San Diego '93, SPIE Proceedings, Vol. 2038, 1993. D. Cai, Y.-C. Lai and R. L. Winslow, ``Periodicity, quasiperiodicity and chaos in coupled cardiac pacemaker cells,'' pp. 10-21 in Chaos in Biology and Medicine, San Diego '93, SPIE Proceedings, Vol. 2036, 1993. Y.-C. Lai, C. Grebogi and T. Tel, ``Controlling transient chaos in dynamical systems,'' pp. 153-167 in Towards the Harnessing of Chaos, edited by M. Yamaguti, Elsevier Science Publishers, 1994. C. Grebogi and Y.-C. Lai, ``Control and use of chaos,'' pp. 393-402 in Nonlinearity and Chaos in Engineering Dynamics, edited by J. M. T. Thompson and S. R. Bishop, Wiley Interscience, New York, 1994. R. L. Winslow, D. Cai and Y.-C. Lai, ``Network models of the SA node,'' pp. 86-91 in Proceedings of the IFAC Symposium on Modeling and Control in Biomedical Systems, 1994. R. L. Winslow, D. Cai and Y.-C. Lai, ``Factors controlling generation and propagation of pacemaker potentials in network models of mammalian SA node,'' pp. 560-569 in Supercomputing'94 Conf. on High Performance Computing and Communications, IEEE Computing Society, 1994. Y.-C. Lai, ``Classical and quantum chaotic scattering,'' pp. 211-234 in Chaos: The Interplay between Stochastic and Deterministic Behaviours, Lecture Notes in Physics, Vol. 457, Springer, Berlin, 1995. C. Grebogi and Y.-C. Lai, ``Stabilizing Unstable Periodic Orbits in Chaotic Dynamical Systems,'' pp. 83-97 in Proc. of the Institute of Electrical Engineers Waseda Workshop, Japan, 1996. C. Grebogi, Y.-C. Lai and S. Hayes, ``Chaos: control and communication,'' pp. 15-29 in Nonlinear Dynamics in Lasers, SPIE Proceedings, Vol. 2792, 1996. Y.-C. Lai, C. Grebogi and J. A. Yorke, ``Intermingled basins and riddling bifurcation in chaotic dynamical systems,'' pp. 138-163 in US-Chinese Conference on Recent Developments in Differential Equations and Applications, edited by P. W. Bates, S.-N. Chow, K. Lu, and X. Pan (International Press, 1997). E. Barreto, Y.-C. Lai and C. Grebogi, ``Controlling chaos with applications to mechanical systems,'' pp. 285-302 in Dynamics and Chaos in Manufacturing Processes, edited by F. C. Moon (John Wiley & Sons, 1998). C. Grebogi, Y.-C. Lai, and S. Hayes, ``Controlling chaos with applications to nonlinear digital communication,'' pp. 114-133 in Chaos and Noise in Biology and Medicine, edited by M. Barbi and S. Chillemi (World Scientific, 1998). C. Grebogi and Y.-C. Lai, ``Controlling chaos,'' pp. 1-20 in Handbook of Controlling Chaos, edited by H. G. Schuster, (Wiley-VCH, 1999). T. Tel, Y.-C. Lai, and C. Grebogi, ``Controlling transient chaos,'' pp. 181-203 in Handbook of Controlling Chaos, edited by H. G. Schuster, (Wiley-VCH, 1999). C. Grebogi, Y.-C. Lai, and S. Hayes, ``Control and applications of chaos,'' in Visions of Nonlinear Science in the 21st Century, edited by J. L. Huertas, W.-K. Chen, and R. N. Madan (World Scientific, 1999). Y.-C. Lai, ``Chaotic dynamics: introduction and recent developments,'' in Recent Advances & Cross-Century Outlooks in Physics, edited by P. Chen and C.-Y. Wong (World Scientific, 1999). Y.-C. Lai, V. Andrade, R. Davidchack, and S. Taherion, ``Experimental manifestations of phase and lag synchronizations in coupled chaotic systems,'' in Proceeding of the 5th Experimental Chaos Conference, edited by L. Pecora et al. (World Scientific, 2000). Y.-C. Lai and C. Grebogi, ``Necessity of statistical modeling of deterministic chaotic systems,'' in Third Tohwa University Conference on Statistical Physics, edited by M. Tokuyama and H. E. Stanley (American Institute of Physics, 2000). Y.-C. Lai and C. Grebogi, ``Riddling in chaotic systems,'' in EQUADIFF 99, edited by B. Fiedler (World Scientific, 2000). Y.-C. Lai, Z. Liu, N. Ye, and T. Yalcinkaya, ``Nonlinear time series analysis,'' pp. 305-340 in The Handbook of Data Mining, edited by N. Ye (Lawrence Erlbaum Associates Publishing, London, 2003). R. Akis, J. P. Bird, D. Vasileska, D. K. Ferry, A. P. S. de Moura, and Y.-C. Lai, ``On the influence of resonant states on ballistic transport in open quantum dots: spectroscopy and tunneling in the presence of multiple conducting channels,'' pp. 209-276 in Electron Transport in Quantum Dots, edited by J. P. Bird (Kluwer Academic Publishers, Boston, 2003). Y.-C. Lai, A. E. Motter, and T. Nishikawa, ``Attacks and cascades in complex networks,'' Lecture Notes in Physics 650, 299-310 (Springer-Verlag, 2004). M. Shah and Y.-C. Lai, ``Performance of integer parameter estimation algorithm for GPS signals in noisy environment,'' pp. 166-174 in ION GNSS 17th International Technical Meeting of the Satellite Division, Sept. 21-24, Long Beach, CA. V. Kamath, Y.-C. Lai, S. Urval, L. Zhu, ``Empirical mode decomposition and blind source separation methods for antijamming with GPS signals,'' pp. 335-341 in IEEE PLANS (Position Location and Navigation Symposium) (San Diego, 2006). Y.-C. Lai, X.-G. Wang, and C. H. Lai, ``Physics of network security,'' pp. 3-10 in Proceedings of the International Symposium on Topological Aspects of Critical Systems and Networks, Sapporo, Japan (World Scientific Publishing Co., 2007). Y.-C. Lai, I. Osorio, M. G. Frei, and M. A. F. Harrison, ``Are correlation dimension and Lyapunov exponents useful tools for prediction of epileptic seizures?'' pp. 454-478 in Computational Neuroscience in Epilepsy, eds. I. Soltesz and K. Staley (Elsevier, 2007). I. Osorio, M. G. Frei, and Y.-C. Lai, ``Neuronal synchronization and the `intio-centric'vs the network theory for ictiogenesis: mechanistic and therapeutic implications for clinical epileptology,'' pp. 109-115 in Seizure Prediction in Epilepsy - From Basic Mechanisms to Clinical Applications, edited by B. Schelter, J. Timmer, and A. Schulze-Bonhage (Wiley-VCH, Darmstadt, Germany, 2008). Y.-C. Lai, ``Superpersistent chaotic transients,'' pp. 131-152 in Nonlinear Dynamics and Chaos: Advances and Perspectives, eds. M. Thiel, A. P. S. de Moura, and C. Grebogi, Springer-Verlag, Berlin, 2010. Y.-C. Lai, ``Applications of nonlinear dynamics and chaos in micro- and nano-scale systems,'' International Conference on Applications in Nonlinear Dynamics (Lake Louis, Canada), AIP Conference Proceedings 1339, 88-95 (2011). S. Yang, L. Yuan, Y.-C. Lai, X.-T. Shen, P. Wonka, and J.-P. Ye, ``Feature grouping and selection over an undirected graph,'' pp. 922-930 in Proceedings of the 18th ACM SIGKDD International Conference on Knowledge Discovery and Data Mining (ACM - Association for Computing Machinery, 2012). Y.-C. Lai, ``Exploiting chaos for quantum control,'' pp. 3-10 in International Conference on Theory and Application in Nonlinear Dynamics (ICAND 2012) (Springer International Publishing, Switzerland, 2014). Y.-C. Lai, ``Reverse engineering of complex dynamical systems based on compressive sensing,'' pp. 203-214 in Chaotic Signal Processing, edited by H. Leung (Higher Education Press, Beijing, 2014). C. Grebogi, Y.-C. Lai, and W.-X. Wang, ``Microscopic approach to species coexistence based on evolutinary game dynamics,'' Chapter 18 in Chaos, Information Processing and Paradoxical Games - The Legacy of John S. Nicolis, eds. G. Nicolis and V. Basios (World Scientific, Singapore, 2015). Y.-C. Lai, ``Multistability in Nanosystems,'' pp. 53-64 in Proceedings of the 4th International Conference on Application in Nonlinear Dynamics (ICAND 2016), eds. V. In, P. Longhini, and A. Palacios (Springer, 2017).